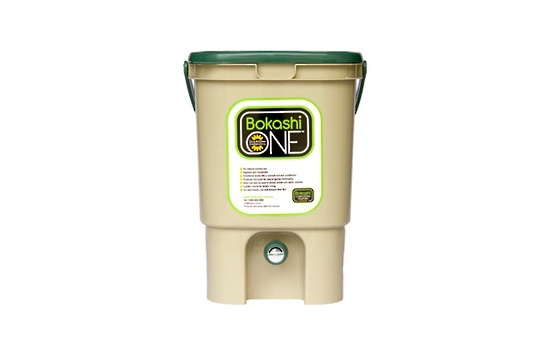 The Bokashi One Bucket reduces the need for an outside compost pile and is easier to maintain than a worm farm. The airtight lid ensures an ideal environment for anaerobic fermentation to take place, while controlling odours and deterring flies. Placing the plastic grate inside the bucket and then piling food waste on top of it separates the food waste from the liquid that accumulates at the bottom of the bucket. This liquid can be easily drained through the tap and used as a nutrient-rich fertiliser for the garden. The Bokashi One Plastic Bucket is 410mm high, 310mm wide and 300mm deep, stores neatly under kitchen sink, It can hold 20 litres of food waste. It is available in 3 colours Black, White and Tan with green lid. Just about all kitchen waste, (which is a huge benefit of Bokashi One composting over worm farms or traditional composting), although it’s best to avoid large bones and excessive amounts of liquid. The amount of juice your Bokashi One kitchen composting system produces depends on the type of food stored in it; so don’t be concerned if little or no juice is produced. Adding fruit and vegetables tends to increase juice production. Be careful not to add too much Bokashi One Mix as this can result in reduced juice creation. Take care with the tap. Do not unscrew more than ¾ of a turn. If you think the tap is blocked, try clearing with a skewer. BOKASHI JUICE MUST BE DILUTED PRIOR TO USE IN THE GARDEN. READ ON! 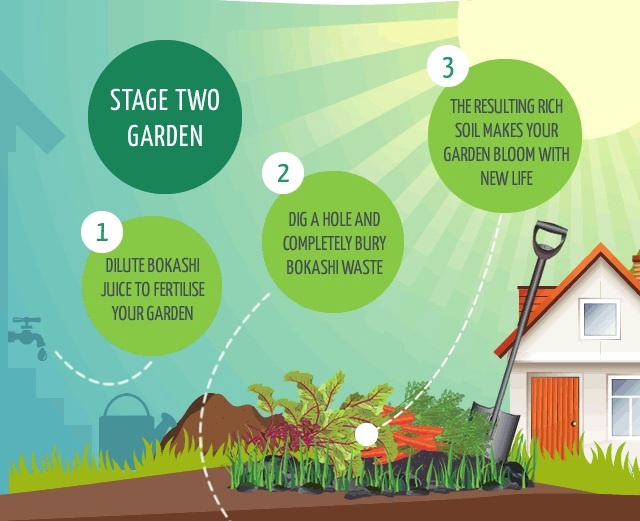 Bokashi juice contains nutrients from the food waste and is alive with micro-organisms so it makes a terrific, free fertiliser! it is very strong so must be diluted with water at a 100:1 ratio, that's 100 parts water to 1 part bokashi juice, approximately 2 teaspoons of juice for every litre of water. 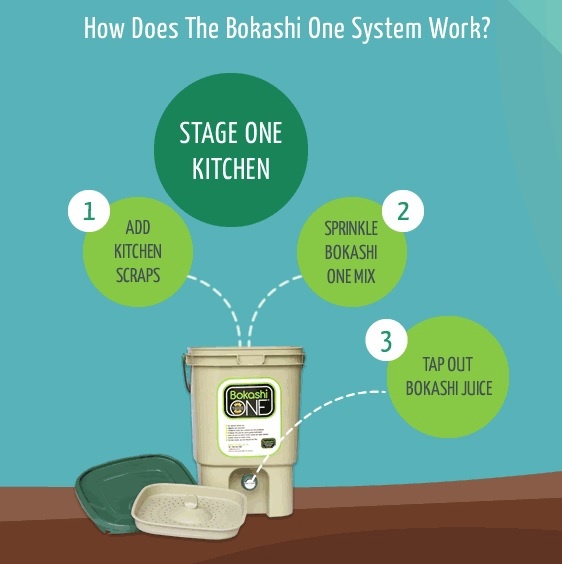 Pour the concentrated Bokashi juice directly into kitchen and bathroom drains, toilets and septic systems. It will help prevent algae build-up and control odour. And as a huge bonus, it contributes to cleaning up our waterways as the good bacteria compete with the bad bacteria! Bokashi juice is best if drained often (twice weekly) and used immediately.